Sometimes human lives connect in mysterious ways and often it seems they do so for a purpose. Sonny Bono. Michael Kennedy. Wendy Moore. Each of these lives ended prematurely and tragically in winter sporting accidents and each left a legacy. While the first two names may be more recognizable, Wendy Moore’s legacy may prove the most enduring. Wendy’s father, Dan T. Moore, is a "technology capitalist." His group of companies has built a reputation as an entrepreneurial incubator, specializing in the cultivation of technology-based ventures. When his daughter Wendy was killed in a downhill skiing accident, Dan decided to combine his personal inspiration and professional expertise to prevent further deaths. His goal became: "Build a better helmetÑnot just any helmet, but a better helmet." It resulted in the formation of a new company, Team Wendy. While other helmet designs existed, Moore found them lacking in strength, durability and, perhaps of most importance, in acceptance. Chip Leon, President of Team Wendy, worked with RTP Company to find a material to address both issuesÑheadgear that would be both functionally protective and stylishly popular. Leon settled on an RTP 300 Series high flow polycarbonate compound using RTP Company’s chroma-shift color technology. The combination of strength (tensile strength of 9500 psi / 65 MPa), stiffness, (flexural modulus of 0.34 x 106 psi / 2343 MPa) and impact resistance (notched Izod impact strength to 15.0 ft lbs/in / 801 J/m) provides an ideal shell material. But what makes RTP Company the supplier of choice is its offerings in color technology. According to Leon, "Unique colors such as gold and blue sparkle, jade, silver flake and emerald provide the appeal needed to gain acceptance." 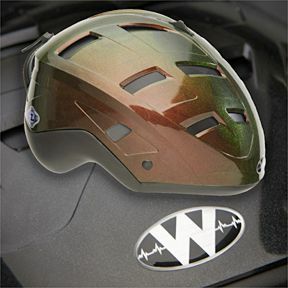 Unlike competitive models, which are typically painted, the rich colors of the Team Wendy helmets are molded into the shell eliminating unsightly chipping and minimize abrasion marks after regular use. Further, chroma-shift coloring provides a dynamic metamerism; hues that change dramatically as light is reflected at different angles. This technology utilizes a precise combination of pigments and dyes that flow throughout the shot in a controllable pattern, producing brilliant, shimmering colors patterns. Initially, the sharp colors visually exaggerated flow inconsistencies near knitlines. In response, RTP Company engineers added a flow enhancement package and suggested processing techniques that, together, softened flow fronts and greatly reduced visual weldlines. Leon added that RTP Company’s accurate guidance was available immediately and that the problem was resolved with a single telephone call. As much as applied technology, the role RTP Company plays in popularizing safety gear is perhaps as crucial to Team Wendy’s goal of saving lives. Leon cites a growing partnership with RTP Company in the area of market research as having the greatest potential to reach that goal. As a member of the Color Marketing Group, RTP Company contributes to research from which consumer preferences and future trends in color are predicted. Says Leon, "RTP Company’s wealth of experience with color provides us with an invaluable resource for the success of our marketing efforts, and our goal of making headgear become standard gear." Team Wendy is headquartered in Cleveland, OH, and manufactures safety equipment for action sports, visit their website at www.teamwendy.com. Molding is done by North Star Molding of Glenwillow, OH, contact them at (440) 349-9820.